I only spotted one example of narrowcasting an event this campaign. 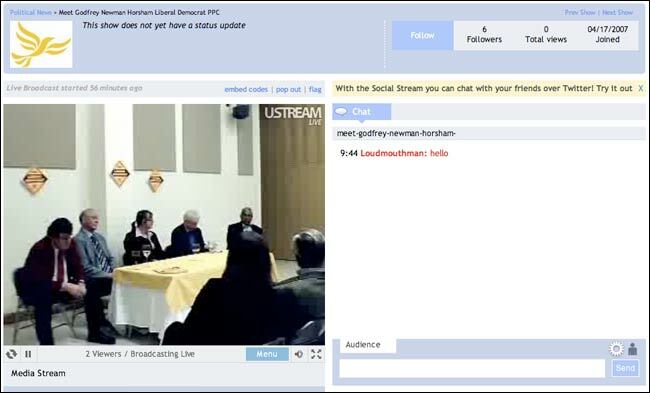 It was a uStream feed of a public meeting with Liberal Democrat candidate Godfrey Newman in Horsham. The quality wasn't great and the online audience when I logged on was in single figures. Nevertheless, it is safe to assume that by the next election mobile bandwidth will be faster, data will be cheaper, and smartphones will be more powerful. Indeed, I wouldn't be surprised to see networked versions of devices like the Flip entirely optimised around streaming. It will be relatively trivial for candidates and local activists to broadcast their own campaigns and hustings live. Imagine the fun we would have with a Manish Sood or Glenn Tingle channel. One problem with narrowcasting is how you get these niche streams in front of an audience. My second trend - political linked data - may help here. We are at a point where we have lots of content and data-driven services on the web that rely on having an abstract model of our political landscape. However, we don't have a reliable way of linking that data, and programatically knowing that this Stella Creasy page is about the same Stella Creasy as this page and this interview is with her and that these are her leaflets and these are her tweets. Nor, if she gets elected today, can we automatically join all that to her record in Parliament as it will be recorded by They Work For You and Public Whip. I'm confident that come the next election there will be a public-facing "MusicBrainz" for politics, providing permanent canonical URIs which can be used to aggregate content around candidates, constituencies and parties. Why will this be important? Well, take the narrowcasting example I gave earlier. If that uStream footage had been tagged with the right machine-readable codes for Liberal Democrat and Godfrey Newman and Horsham, it could have been aggregated by other web platforms and services like Sky's or The Guardian's or the BBC's page for the constituency. 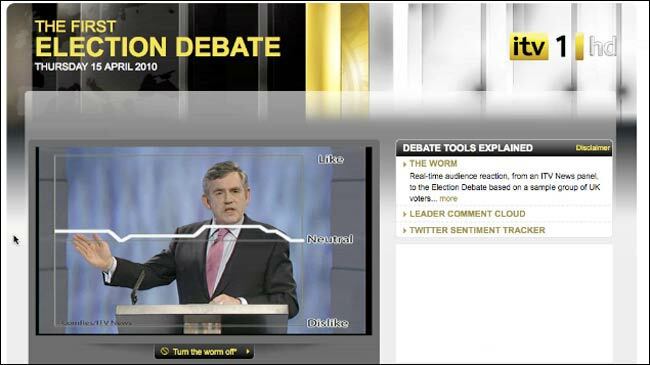 Whether it was The Worm on ITV, Rate The Debate on Facebook or Tweetminster's sentiment analysis, in this campaign near real time analysis of the public sentiment around an event has proved very popular with broadcasters and the social media back channels. Next election I'd expect to see these kinds of tools used even more widely, to provide an instant numerical judgement on the individual impact of every set piece speech, press conference, walkabout and gaffe. I'd also expect the parties to use this kind of sentiment analysis more to judge instant reaction to their election broadcasts. By tracking the conversation around the TV programme that appears before or after their slot, they can spot any trends in the instant public reaction. I'll be continuing to keep my General Election digital timeline updated over the next few days, so please send suggestions of anything you think I've missed to martin.belam@currybet.net or message me on Twitter - @currybet. And however you choose to vote today, please remember to vote. However disillusioned people might be with our current crop of politicians, and for all of the flaws in the system, people fought long and hard and died to obtain the universal vote. Please take the time to use yours today. By Martin Belam on 6 May 2010.
who said that data linking has to be done programatically? Let's first create the workflows for maintaining links manually, and create some benefit from the resulting linked data. The magic black box of automated linking can wait, no?